The Office is a great pub on Sydney Street in the heart of the North Laine. It has been there for years and is a place that I frequented regularly in my younger years! It has always been known for the Thai kitchen there but I’m afraid I was only ever interested in its rather large gin and tequila collection back then! 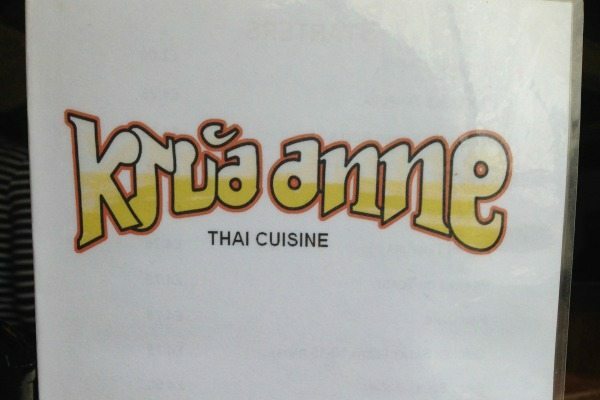 The Kitchen – Krua Anne Thai Cuisine – runs all week except Sundays. They have two sittings during the week (12.00-15.00 & 18.00-21.00) and then they are open all day on a Saturday (12.00 – 21.00). Perfect to catch the all important corporate and student trade during the week (there are offices all around with hungry workers and Brighton City College is just on the next street), and then the frantic shoppers needing a quick refuel at the weekend. Myself and a Friend found ourselves without children one Monday lunchtime (hurrah!) and so decided to give the place a go. 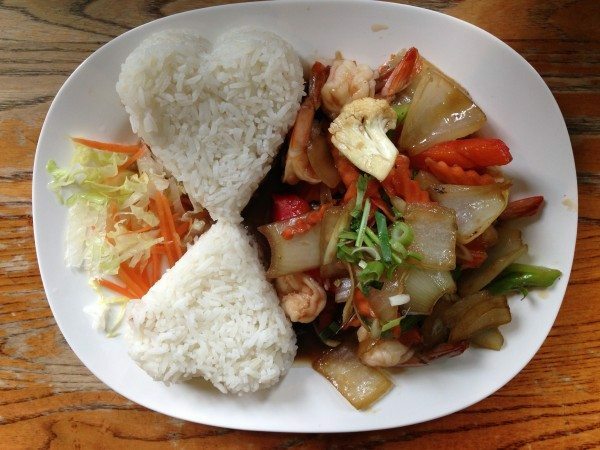 The menu is extensive and offers a good selection of starters and soups together with a wide range of main dishes including rice, noodles and stir fry meals. Each dish clearly indicates if the plate is spicy and if so how hot together with whether or not rice is included. There is an opportunity to order different flavours of rice as a side order should you wish to do so. 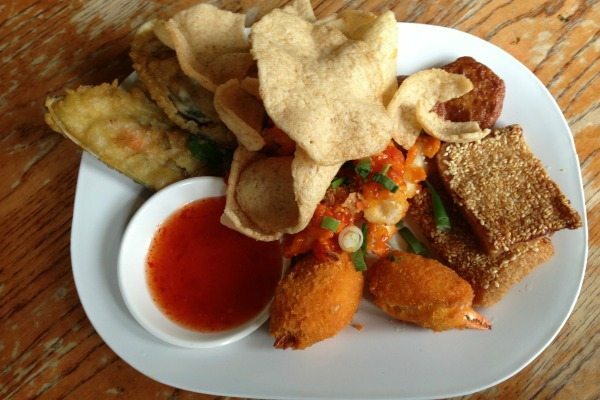 As a starter we decided upon the Mixed Seafood Starter to share (£8.95) this consisted of Prawns on Toast, Fish cake, Crab Claw, Spicy Squid, Mussel Tempura and Crackers – all served with a sweet chilli sauce. This dish was a meal in itself and was packed full of flavour and spice. The fish cakes were just as they should be and the lime really came through in them. The mussels were huge and coated in a light and crisp batter, the Crab Claw was very meaty yet not heavy at all and the Spicy squid did not disappoint – spicy!! Everything on this plate really packed a punch and my chum and I took no time in devouring the whole dish. Next up were the main dishes. With so many to choose from it was difficult to make a decision as they all sounded wonderful, however my Chum decided upon the Ta-Khai-Hom (King prawns, lemongrass with chilli and herbs – £8.50). By all accounts it was delicious (I didn’t get a look in!). The lemongrass really came through and lifted the dish whereas there was a hint of chilli that gave the dish just the right amount of kick!! She couldn’t fault it. 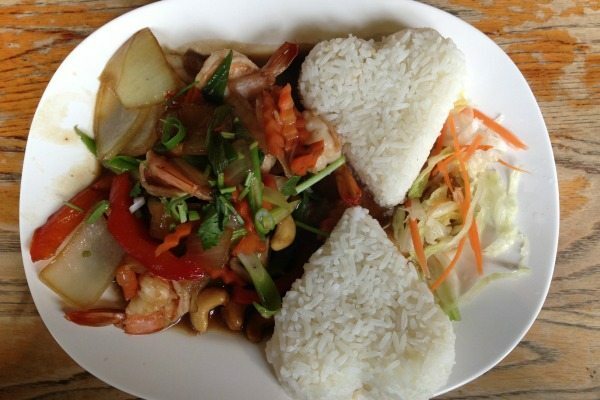 For myself I chose the Pad Mamoungan Hin Mapham (stir fry with roasted cashew nuts and king prawns – £8.50). This is a stunning dish full of subtle flavours, no spice at all so perfect for the more discerning palate. The cashews gave added texture to the meal and complimented the prawns and flavours beautifully. 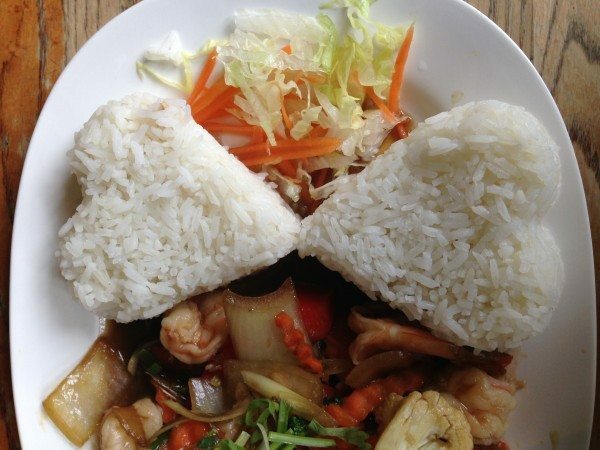 The sticky rice for each dish was served in the form of two hearts on the plate and added to the whole presentation of the meal. The plates were perfect in size too – and although we ate everything that was served we by no means would have wanted anymore. Both of us opted to have prawns in our dishes hence the cost was a very reasonable £8.50 each (the same price would also apply if you wanted mixed seafood). However, if you would prefer your meal to be vegetarian or to contain chicken or beef then the cost of a dish would be even more purse friendly at £7.50. All in all both myself and my chum had a wonderful childfree time, enjoying tasty food in a surrounding where we spent our misspent youth!! And will definitely be a place we shall return to should we be lucky enough again! !